Street Scape in the City of Orange, CA. Oil painting of Barrio Orange at sunset with a resident walking to local grocery store. This Limited Edition Giclee is 24 x 30, its original size. There are only 120 high quality canvas prints available including a Certificate of Authenticity. A Sunday Morning in OVC was painted in 1980. 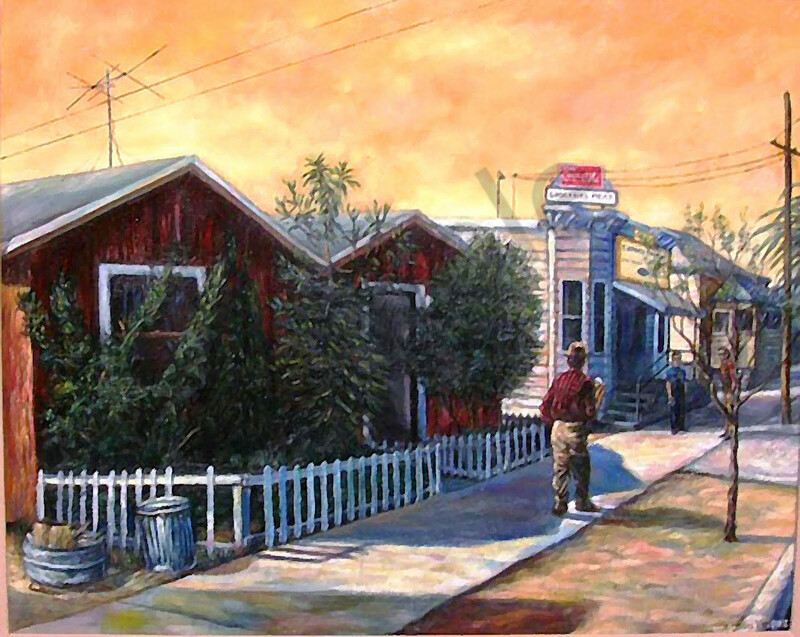 The painting is from a photograph taken on a Sunday morning in back of the Luna Market, at the corner of North Cypress Street and West Sycamore Avenue, Orange, California, in 1970. The Santiago Orange Growers Association Ice House is in the background. This Limited Edition Giclee is 24 x 30, its original size. There are only 120 high quality prints available including a Certificate of Authenticity. The price is exclusive of any tax, shipping, or frame.